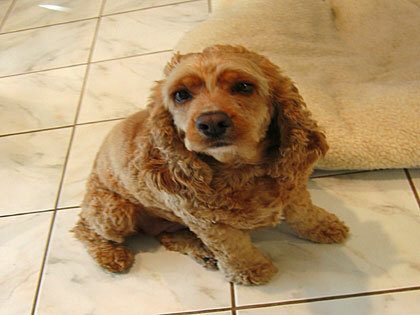 Boo Boo, my red and blonde cocker spaniel who was born in 1998 (I do not remember the exact month and day. ), came into my life when my younger sister brought her home from a pet shop. I refer to Boo Boo as the Puppy Doll because she reminds me of a stuffed animal. That tiny puppy blossomed into a beautiful dog. She does not bond with people as easily as Bagel, my beagle does. Initially, the only people with whom she bonded were my younger sister and my mother. It took a long time for Boo Boo to bond with other members of the family besides myself. We have found that once she gets to know us, she is a sweet, loving dog. The slightest movement or noise frightens her. On a few occasions when I took the dogs out, we would see kids on bicycles or skateboards, and the noises from the bicycles and the skateboards scare her. The Puppy Doll loves food, but she does not get as fired up about food as Bagel does. When I eat something, she sits near me hoping that I would drop a tidbit her way. There have been times in which Boo Boo camps out by bedroom door, especially when I get up in the morning. Sometimes, she likes to lie on the carpet in the computer room while I am working. Check out Boo Boo's photos.